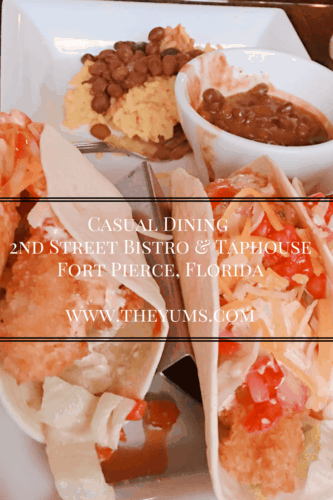 Experience casual open-air dining at 2nd Street Bistro in Fort Pierce, Florida. Dine on their large outdoor dining patio and enjoy people watching in downtown. For those looking to escape the hot, humid South Florida heat, you can head inside for air-conditioned dining. 2nd Street has a beachy, laid-back casual vibe that appeals to the whole family. With one of the most extensive cocktail menus in Fort Pierce and some of the best bartenders who are waiting to shake up your favorite cocktail, 2nd Street is a favorite watering hole for locals and visitors alike. For beer lovers, there is a variety of brews to choose from. Your four-legged pals won’t be left out either! 2nd Street is dog-friendly and welcomes your fur baby with a fresh bowl of water. For dog owners, it is such a treat to dine out with Fido, and at 2nd Street, they are the star of the show! The wait staff loves your furry friends! Menu: The burgers are all hand shaped, ½ lb and made to order. Our personal favorite is the Vero Beach Burger, with brie, truffle aioli, arugula and caramelized onions. The burgers are juicy and tasty. You have your choice of sides, including hand-cut fries, home-made skin-on potato chips (these are to die for delicious! ), and several salad options. In addition to their burgers, 2nd Street offers an excellent selection of appetizers, including gator bites, conch fritters, and wings. Other menu items include a good variety of sandwiches, salads, pizza, and tacos. Thoughts: 2nd Street is reminiscent of the corner neighborhood bar where everybody knows your name. On Monday nights during football season, there is no shortage of games to watch. Inside there are multiple screens with different games on each, and outside on the patio, you have your choice of games on two screens. Gather your friends and watch the game and let 2nd Street do the cooking! Fried Pickles – they are fabulous! And you can’t eat just one. Spinach Goat Cheese Pizza – covered in fresh spinach, goat cheese and roasted red peppers with a basil pesto sauce – so yummy! 2nd Street Salad – fresh greens mixed with fresh pear and and topped with a homemade vanilla bean vinaigrette, this salad is fantastic. Chicken Mac – grilled chicken, and Southern-style mac and cheese topped with breadcrumbs; this dish is absolutely sinfully scrumptious. Bistro Bang Shrimp – this is our “go to” appetizer. Succulent shrimp tossed in a sweet Thai chili aioli sauce and topped with , and a drizzle of wasabi sauce is sweet and tangy with just a hint of a bite. The ambiance of 2nd Street is sports bar meets neighborhood hangout. It’s laid-back casual atmosphere, daily happy hour from 3-7 pm and fresh, tasty food make it a favorite among locals and visitors alike. 2nd Street is open seven days a week for lunch and dinner. For hotels in the Fort Pierce area, we have recommendations and reviews here. If you want booking comparisons, we suggest going here. Price Range: $10 -22 for entrees.